Unipole advertising is a form of advertising where a frame structure is attached atop a single pole. 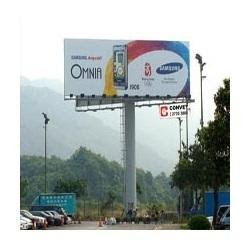 More or less like a billboard, Unipole or Monopole is a popular advertising form which strikes the consumer easily because of their large size and the fact that they are easily visible from far away. You can see numerous Unipole advertisements alongside highways. To add brightness to the Unipole ads, a light box or front-lit illumination is commonly seen to be used in such ads. One primary advantage that Unipole ads have is with regards to its rectangular shape, which allows advertisers to use the space more creatively. This space also allows advertisers to enhance their focus on the message being delivered to the audience. There are a large number of advertising companies and firms who offer Unipole advertisements in Delhi covering almost each and every prime area in the Delhi NCR region. These firms ensure that the brand they are endorsing gets maximum coverage and visibility. By using their creativity and imagination the advertisements are created in a way that they remain fresh in the minds of their audience and draw their attention. Another advantage of Unipole advertisement is that these single pole ads can easily resist the wind, even if it is fierce. Moreover, they can endure high temperature and wind abrasion too. Not only are this, the Unipole ads are of superior quality and so the maintenance interval of such ads is quite long. Single Pole surfaces are mostly anti-rust and anti-Ultraviolet, which also saves them from damage to a great extent. These poles are durable and robust and can resist high earthquakes too. Each component of a Unipole is linked with high power friction grip bolt to give them the right support. Designed perfectly based on high mechanics and aesthetics, these Unipole ads can meet the varying demands of their advertisers. The best part about these Unipole ads is that they are highly flexible and can be assembled in no time. Similarly, it doesn't take much time to dismantle them as well.